Your friends and family may ooh and ahh over your beautiful kitchen, but what secrets are lurking behind the cabinet doors? Are your kitchen cupboards overflowing with plates, cups and accoutrements? Are your kitchen drawers jammed with useless utensils? Do you have three rolling pins that collect a lot of dust and not a lot of action? Like most people who lead busy lives, your kitchen might look great on the surface. But behind those cabinet doors, it’s a whole world of chaos. 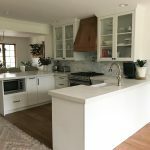 Let’s take a look at how having less in your kitchen cabinets is actually more – more sanity, more space, more happiness – and what you can do to get it. Do you need to remodel your kitchen? You may think that kitchen storage is your problem and that you need to invest in remodeling your cabinetry. That may well be the case, but it’s not always necessary. Thinking through your kitchen storage and how you use it can rejuvenate the space. Plus, this is a budget-friendly process that may solve a lot of your issues. Here are some of our favorite tips to follow if you need to put your, er, house in order again! Getting rid of everything that’s not necessary, out of date or just plain weird is the first step towards having a more organised and harmonious kitchen. Go through all your cabinets and drawers and empty them out. Go on, do it! Do a duplicate check. Four peelers? Three colanders? It’s easy to accumulate kitchen equipment over the years, whether it’s a new purchase, a birthday gift or a fresh cohabitation. Forget about needing to have a spare whatever. Go through your pile of accoutrements and jettison the junk. It’s not worth it! Get real with yourself about that vintage 1950s cookware: Ask yourself when was the last time you used it. If you haven’t touched something for a year, recycle or re-home it. Rethink hiding items in the back or way up top. Ultimately that will only make your storage more cramped. Plus, one of the quickest ways to damage those expensive drawer units or cupboards is to over-fill them. We know. We’re human too! It’s so easy to shove something in a cupboard, close the door and then forget about the chaos behind the facade. Don’t let the chaos win. Let go of what you don’t need and donate to your local charity. The goal is to keep only the things you use regularly. Don’t you feel lighter already? There are some things in your kitchen, like cutlery, plates and glasses, that you’ll use everyday. Others, like baking trays, waffle machines, coffee grinders, etc, you might only use on the weekend. Make sure that the things you use on a daily basis are easily within reach. Items like that huge French roasting dish that you only ever use at Christmas should be stored well out of the way. Instead of overloading a cupboard with things you use and things you don’t, why not have a “for special occasions only” cupboard, far away from the items you use on a daily basis. That way, you won’t be forever working your way around things you never use. Keep your plates near your cutlery because you use them in tandem. Glasses and cups are best kept in a corner cupboard, near the tap. Keep your kettle and coffee machine pretty close to this area, too. By storing objects that work together in close proximity, you help with your own time management. 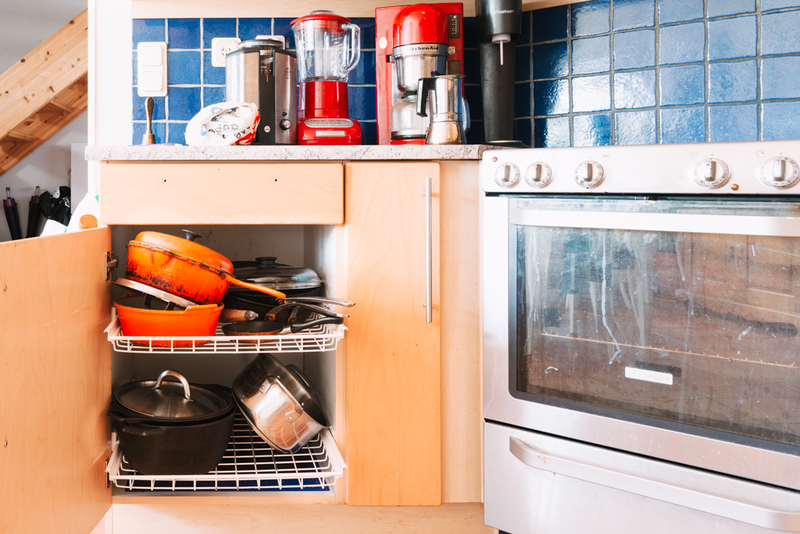 Instead of running all over your kitchen to fetch items, said items are located in logical places for certain tasks. Once you’ve got your cupboards’ contents simplified, consider getting rid of those plastic storage boxes. Instead, think about glass jars to store your dry goods. With one quick glance you know exactly how much flour, sugar and cereal you have available. Storing these items together helps maximize your intelligent storage. If you’re not happy with the idea of ditching your plastic storage boxes, make sure you use nifty labels to save time locating what you need. You’ll thank yourself every time you need to quickly assess how much pasta you have. Both of these options will help you maximize your efficiency and organization in the kitchen. Just like your cupboards, you need to organise your drawers. As mentioned previously, grouping items used in tandem helps with everyday efficiency. IKEA has some really useful organising units that you can put inside the drawer to keep things organised. If you’ve got everyday cutlery and “best” cutlery, store them separately. Don’t make yourself crazy having to sort between the two options when you set the table. The coffee grinder. The toaster. The kettle. The washing up liquid. We could go on and on. The rule here is to keep things as simple as possible. The more negative space on the countertops, the less chaotic your kitchen will feel. Take stock of what’s truly necessary for everyday functioning. It’s also really important not to overly clutter the kitchen tabletops. Even if you want to have access to washing up liquid, brush and hand soap, these don’t need to be standing there. Put them on a nice tray to group them in a beautiful, intentional way. When is it time to remodel ? Of course, there does come a time where you simply outgrow your kitchen. The units your bought 15 years ago just don’t have the smart storage solutions that designers have come up with in recent years. And sometimes you just need some help finding solutions to the things in your kitchen design that just don’t seem to be working for you. If you’re struggling to see the right solution for your needs, you might want to think about IKD can do for you. We specialize in finding intelligent and beautiful ways in which modern IKEA kitchens can fit your kitchen. 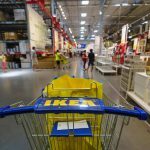 We don’t just have a deep understanding of design, we’re passionate about IKEA kitchens and have a thorough knowledge of the current systems and products available in IKEA stores. We’re also able to advise you on the right installers in your region to ensure you get the very best service in terms of design and kitchen installation. Why not discover more ?